Gospel music is a genre of Christian music. The creation, performance, significance, and even the definition of gospel music varies according to culture and social context. Gospel music is composed and performed for many purposes, including aesthetic pleasure, religious or ceremonial purposes, and as an entertainment product for the marketplace. Gospel music usually has dominant vocals with Christian lyrics. Gospel music can be traced to the early 17th century, with roots in the black oral tradition. Hymns and sacred songs were often repeated in a call and response fashion. Most of the churches relied on hand clapping and foot stomping as rhythmic accompaniment. Most of the singing was done a cappella. The first published use of the term "gospel song" probably appeared in 1874. The original gospel songs were written and composed by authors such as George F. Root, Philip Bliss, Charles H. Gabriel, William Howard Doane, and Fanny Crosby. Gospel music publishing houses emerged. The advent of radio in the 1920s greatly increased the audience for gospel music. Following World War II, gospel music moved into major auditoriums, and gospel music concerts became quite elaborate. Oakwood University is a private, historically black Seventh-day Adventist university in Huntsville, Alabama. It is owned and operated by the Seventh-day Adventist Church. In 1980, Claude McKnight, older brother of R&B musician Brian McKnight, formed an a cappella quartet, The Gentlemen's Estates Quartet, at Oakwood College (now Oakwood University), a Seventh-day Adventist university in Huntsville, Alabama, where he was a freshman. He auditioned students for the group. While rehearsing in a campus bathroom to prepare for a performance, Mark Kibble heard them singing. He joined the harmonizing, adding a fifth part with them onstage that night. Kibble invited Mervyn Warren to join the group, which performed under the name Alliance. Alliance performed in local churches and on campus with a changing roster of members. In 1985, the lower half of the group (bass, baritone, and second tenor) left after graduating. Alvin Chea, Cedric Dent, and David Thomas joined. The Seventh-day Adventist Church is a Protestant Christian denomination which is distinguished by its observance of Saturday, the seventh day of the week in Christian and Jewish calendars, as the Sabbath, and its emphasis on the imminent Second Coming (advent) of Jesus Christ. The denomination grew out of the Millerite movement in the United States during the mid-19th century and it was formally established in 1863. Among its founders was Ellen G. White, whose extensive writings are still held in high regard by the church. Mervyn Edwin Warren is an American film composer, record producer, music conductor, music arranger, lyricist, songwriter, pianist, and vocalist. Warren is a five-time Grammy Award winner and a 10-time Grammy Award nominee. Warren has written the underscore and songs for many feature and television films and has written countless arrangements in a variety of musical styles for producers Quincy Jones, David Foster, Arif Mardin, and dozens of popular recording artists, including extensive work on Jones' Back on the Block,Q's Jook Joint, and Q: Soul Bossa Nostra. The band signed a contract with Warner Alliance  in 1987 and changed its name to Take 6 after a search revealed the name "Alliance" was in use. Their eponymous debut album (1988) won Grammy Awards in the gospel and jazz categories and three Dove Awards. They contributed to the film Do the Right Thing and sang on the album Back on the Block by Quincy Jones. The band's second album, So Much 2 Say (1990) appeared on the gospel, jazz, and R&B charts of Billboard magazine. The band then signed with Reprise. In 1991, after the release of So Much 2 Say, Mervyn Warren left the group to pursue a career as a record producer and was replaced by Joey Kibble, Mark Kibble's younger brother. The group added instrumentation to their a cappella sound on the album He Is Christmas. Warner Alliance was a Contemporary Christian imprint of Warner Music Group. Its operations were suspended in 1998. Artists on the label included Steve Taylor, Kim Boyce, Michael English, the Brooklyn Tabernacle Choir, Caedmon's Call, Sarah Jahn, Donnie McClurkin, First Call, Wayne Watson, Take 6, Mid South, and The Worldwide Message Tribe. Albums released on the label are now controlled by Word Entertainment. Do the Right Thing is a 1989 American comedy-drama film produced, written, and directed by Spike Lee. It stars Lee and Danny Aiello, Ossie Davis, Ruby Dee, Richard Edson, Giancarlo Esposito, Bill Nunn, John Turturro, and Samuel L. Jackson, and is the feature film debut of Martin Lawrence and Rosie Perez. The story follows a Brooklyn neighborhood's simmering racial tension, which culminates in tragedy on a hot summer day. Back on the Block is a 1989 studio album produced by Quincy Jones. The album features legendary musicians and singers from across three generations, including Ella Fitzgerald, Miles Davis, Joe Zawinul, Ice-T, Big Daddy Kane, Sarah Vaughan, Dizzy Gillespie, George Benson, Luther Vandross, Dionne Warwick, Barry White, Chaka Khan, Take 6, Bobby McFerrin, Al Jarreau, Al B. Sure!, James Ingram, El DeBarge, Ray Charles and a 12-year old Tevin Campbell. Eros Walter Luciano Ramazzotti is an Italian musician, singer and songwriter. Ramazzotti is popular in Italy and most European countries, and throughout the Spanish-speaking world, as he has released most of his albums in both Italian and Spanish. e² is a greatest hits album by the Italian singer Eros Ramazzotti, released in Europe and Latin America on 26 October 2007. This is his fourteenth album, and his second greatest hits album after Eros in 1997. The first single released from the album was "Non siamo soli", a vocal duet with the Latin singer Ricky Martin. Believe (Sono, 2016), produced by Claude Villani and Ross Vannelli, charted in six categories on Billboard in its first two weeks of release. Iconic (Sono, 2018), produced and arranged by the band, was its first album to chart at No. 1 on the Billboard Contemporary Jazz Chart. [ citation needed ] The first singe was a cover version of "Change the World" by Eric Clapton and debuted on the Contemporary Jazz Song chart in the top 30. The second single, "Sailing", is a cover of the Christopher Cross classic. "Change the World" is a song written by Tommy Sims, Gordon Kennedy, and Wayne Kirkpatrick whose best-known version was recorded by the English singer Eric Clapton for the soundtrack of the 1996 film Phenomenon. The track was produced by R&B record producer Kenneth "Babyface" Edmonds. The Clapton release, recorded for Reprise and Warner Bros. Records, reached the Top 40 in twenty countries and topped the charts in Canada, as well as Billboard magazine's Adult Contemporary and Adult Top 40 charts in the United States. 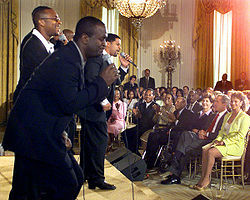 The single won eight awards, including three Grammy Awards at the 39th annual ceremony in 1997. Eric Patrick Clapton, is an English rock and blues guitarist, singer, and songwriter. He is the only three-time inductee to the Rock and Roll Hall of Fame: once as a solo artist and separately as a member of the Yardbirds and of Cream. Clapton has been referred to as one of the most important and influential guitarists of all time. Clapton ranked second in Rolling Stone magazine's list of the "100 Greatest Guitarists of All Time" and fourth in Gibson's "Top 50 Guitarists of All Time". He was also named number five in Time magazine's list of "The 10 Best Electric Guitar Players" in 2009. The Grammy Award for Best Instrumental Arrangement has been awarded since 1963. The award is presented to the arranger(s) of the music. Only songs or tracks are eligible, no longer works. The performing artist does not receive a Grammy, except if he/she is also the arranger. Brian McKnight is an American R&B singer-songwriter, arranger, producer, and musician. He is a multi-instrumentalist who plays piano, guitar, bass guitar, percussion, trombone, tuba, flugelhorn and trumpet. McKnight is most recognized for his strong falsetto and belting range. McKnight's work has earned him 16 Grammy Awards nominations, though he has never won. He is third only to Morten Lindberg and Snoop Dogg for the record of most Grammy nominations without a win. Tower of Power is an American R&B-based horn section and band, originating in Oakland, California, that has been performing since 1968. There have been a number of lead vocalists, the most well-known being Lenny Williams, who fronted the band between early 1973 and late 1974, the period of their greatest commercial success. They have landed a total of eight songs on the Billboard Hot 100; their highest-charting songs include "You're Still a Young Man", "So Very Hard to Go", "What Is Hip? ", and "Don't Change Horses ". Gordon L. Goodwin is an American pianist, saxophonist, composer, arranger, and conductor. He is the leader of Gordon Goodwin's Big Phat Band, and on faculty at the Los Angeles College of Music. He has won Grammy Awards and Daytime Emmy Awards and has received over twenty Grammy nominations for his compositions and arrangements. Gordon Goodwin's Big Phat Band, or simply The Big Phat Band, is an 18-piece jazz orchestra that combines the big band swing of the 1930s and 1940s with contemporary music such as funk and jazz fusion. The band is led by Gordon Goodwin, who arranges, composes, plays piano and saxophone. Since its origin, the Big Phat Band has received several Grammy Awards and many Grammy nominations. The Phat Pack is the third studio album by the jazz ensemble Gordon Goodwin's Big Phat Band. Goodwin received a Grammy Award nomination for Best Instrumental Arrangement for the song "Attack of the Killer Tomatoes". Wayne Bergeron is an American jazz trumpeter who was a member of Maynard Ferguson's band in the 1980s. As a lead and studio player, he is notable for his ability in the upper register of the instrument, as in his screaming trumpet work in the soundtrack for the 2004 Disney/Pixar animated movie The Incredibles. He is on faculty at the Los Angeles College of Music. 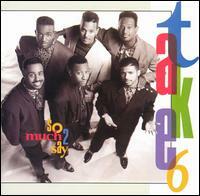 Take 6, released in 1988 on Reprise Records, is the first album by the American contemporary Gospel music group Take 6. The album won the group their first two Grammy Awards for Best Jazz Vocal Performance by a Duo or Group and Best Soul Gospel Performance by a Duo, Group, Choir or Chorus. It also earned the group their first three Dove Awards for Group of the Year, Contemporary Black Gospel Album of the Year, and Contemporary Black Gospel Song of the Year. So Much 2 Say, released in 1990 on Reprise Records, is a Gospel music album by the American contemporary Gospel music group Take 6. Feels Good, released on March 21, 2006, on Take 6 Records, is a Gospel music album by the American contemporary a cappella vocal jazz and Gospel music group Take 6. XXL is the second studio album by Gordon Goodwin's Big Phat Band, released on September 23, 2003. It includes guest performances by saxophonist Michael Brecker, vocal group Take 6, clarinetist Eddie Daniels, and singer Johnny Mathis. Something Inside So Strong is the twenty-first studio album by country music singer Kenny Rogers. The album includes the singles "When You Put Your Heart in It", "Planet Texas", "The Vows Go Unbroken", "Something Inside So Strong", and "Maybe". Gladys Knight, Anne Murray, Holly Dunn, and Ronald Isley are featured as duet partners. Act Your Age is the fourth album by Gordon Goodwin's Big Phat Band. It received a Grammy Award nomination in 2008 for Best Large Jazz Ensemble Album. Gordon Goodwin received nominations for Best Instrumental Composition and Best Instrumental Arrangement ("Yesterdays"). Cannonball Musical Instruments is a manufacturer of saxophones, clarinets, trumpets, flutes, trombones, and musical instrument accessories. The company was founded in 1996 by musicians Tevis and Sheryl Laukat, and is based in Sandy, Utah. Cannonball specializes in professional, handmade, and uniquely "acoustically hand customized" instruments. Dave Siebels With: Gordon Goodwin's Big Phat Band is a jazz album, the sixth of Gordon Goodwin's Big Phat Band. The group teamed up with Dave Siebels, a veteran organist, using many of Siebel's original compositions. The album includes funk, bebop, and modern big band-style songs and was released on December 1, 2008. In the Still of the Night is an album by American pop singer Johnny Mathis that was released on August 8, 1989, by Columbia Records and continues the trend that began with his 1986 collaboration with Henry Mancini, The Hollywood Musicals, in that the project is devoted to a specific theme that ties the songs together. Mathis hints at the theme for this album in the liner notes for his 1993 box set The Music of Johnny Mathis: A Personal Collection, where he gives his thoughts on the 1964 Little Anthony and the Imperials song "I'm on the Outside Looking In" that he covered for his 1988 album Once in a While: "That was group singers' kind of material. I was singing other stuff. It wasn't the picture of the lone crooner standing in the spotlight. That's what I was doing when all this other stuff was going on. I never listened to it until it was brought to my attention by [that album's producers] Peter Bunetta and Rick Chudacoff." Mathis chose to continue his work with Bunetta and Chudacoff on this project, which focuses on "this other stuff" that Mathis refers to: pop and R&B hits from the 1950s and 1960s. Life in the Bubble is an album by Gordon Goodwin's Big Phat Band that won the Grammy Award for Best Large Jazz Ensemble Album in 2015. Goodwin won an additional Grammy Award for Best Instrumental Arrangement for his version of the song "On Green Dolphin Street". 1 2 Ostling, Richard N. (March 20, 1989). "Religion: Evangelism And All That Jazz". TIME. Retrieved May 23, 2014. ↑ "Take 6 Contemporary Christian A Cappella Group". Singers.com. Retrieved May 23, 2014. 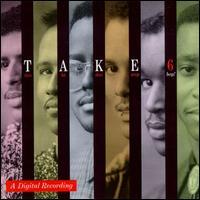 1 2 Ginell, Richard S. "Take 6". AllMusic. Retrieved 2 October 2018. ↑ "Take 6 Believe scores big on the Billboard charts during debut week". sonorecordinggroup.com. Retrieved April 5, 2016. 1 2 Richard S. Ginell. "Take 6 | Awards". AllMusic. Retrieved December 24, 2013.